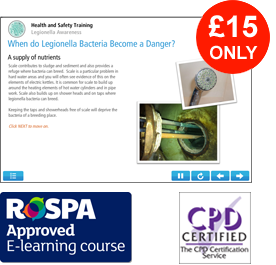 RoSPA and CPD accredited online legionella awareness training £15+VAT per person, is available from i2Comply. Employers, managers and those with responsibility for the control of premises understand what legionella is, what their duties are and how they can comply with health and safety law. Employees are aware of the risk posed by legionella and the measures taken to comply with health and safety legislation. The approximate duration of this training is 60 minutes.